I just added the configuration dialogs of libkmahjongg to KShisen. Players can now select their preferred tilesets and backgrounds, of course all rendered from SVG. 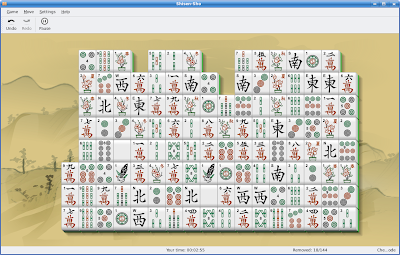 With libkmahjongg both applications can now re-use the same artwork, and this is also available for any future game that uses mahjongg tiles. Next step? Maybe integration with KNewStuff2, we will see. 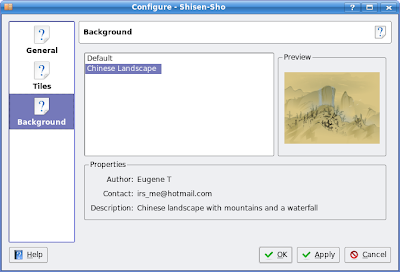 Background selection, using the new chinese landscape contributed by Eugene T. All meta information is ready for translation, including the background and tileset names. The oxygen icons for the config pane are not ready yet. According to recently published data, 8.3 million new computer systems were sold in Brazil last year. And of these, 18% shipped with free software (OS, desktop and applications). So we are talking about 1.5 million new free software desktops! What the story does not tell is that (last time I checked!) all 11 distros that shipped pre-installed in Linux systems in Brazil used KDE as the default desktop. Neat! This assumes qt-copy is being built with opengl support, which is something not strictly required, iirc. Just keeping the list here in case I need it in the future, instead of waiting for a build failure to hunt/install a new package. Of course, now that I have written it down I am sure someone will tell me that all I need is some sort of meta kde4-devel-libraries package, which already exists somewhere! If you missed the post on kde-games-devel, this time hour meeting will be 2 hours long and will start one hour later. Agenda here.